K-Tek’s extensive Stingray line of bags and accessories for boom operators and sound mixers offers the new Boom Sleeves for easy transport of popular mic booms. These padded bags are ideal for carrying K-Tek and other brands of boom poles to location and offer added protection when packed inside hard cases along with other gear for long distance transport. Between gigs, they provide safer and more organized storage. This padded multi-layer sleeve features a smart, foldable design so users can extend or contract the carrier to fit various poles up to 52“ in collapsed length. The bag’s exterior is made of black, heavy-duty nylon with a triple layer laminated core of internal padding, lined with K-Tek’s famous Stingray orange interior fabric. 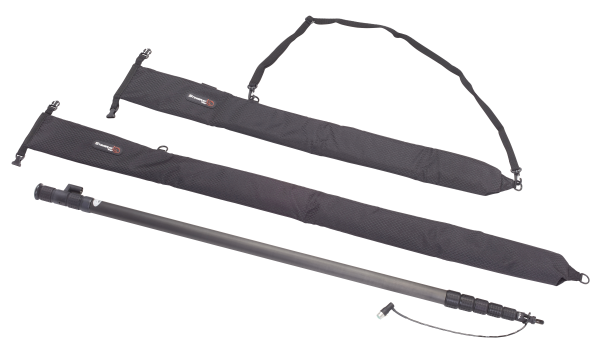 The new Stingray Boom Sleeves are available in two sizes: one for booms up to 52” (132cm) collapsed (Part No. : KSBS52) and a second (Part No. : KSBS35) for boom poles that collapse to 35” (89cm)or less.